Spring has finally sprung and the bees are up and working hard to pollinate our fruit trees so that we can have apples, plums, nectarines, cherries, peaches, passionfruit, pomegranates, apricots and almonds, just to mention a few. If you have fruit trees, next time you are in the garden, say a few words of thanks to the bees. 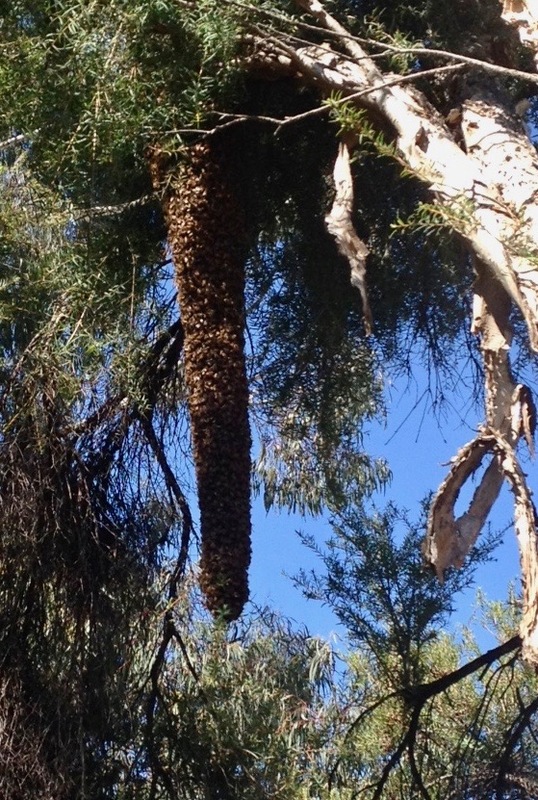 It is the time of year when we get bee swarms. This is when the hive divides, just like a cell in the human body. The old queen takes a number of her faithful worker bees and heads out to find a place for to establish a new hive. You may see them in trees or pergolas as a mass of bees. Meanwhile, one of her daughters will take over as the queen. If a swarm moves into your roof, call the Beekeepers Association of ACT swarm collectors or local beekeeping association and they will gladly rehouse the bees into a hive. Swarm from local bees are often better adapted to local climate and flora. It is also the time for our native bees to emerge from their burrows. 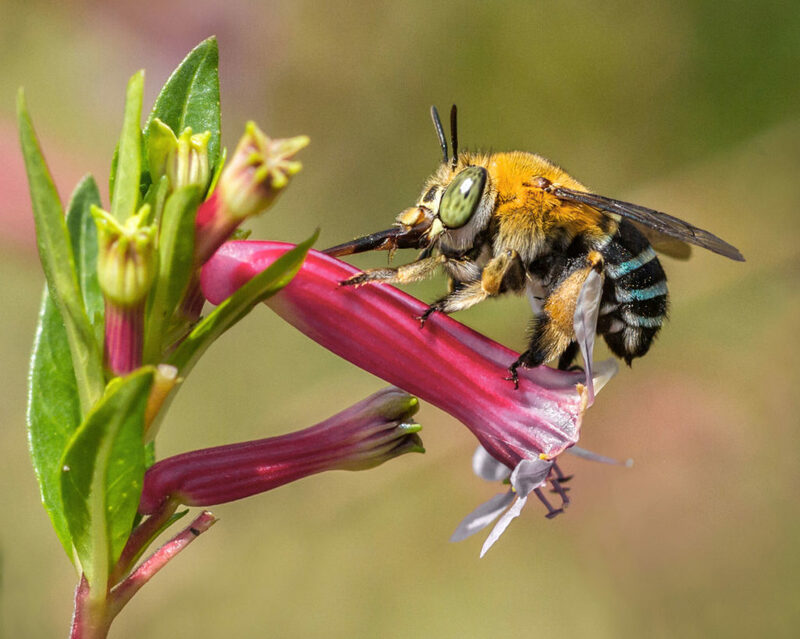 The Blue Banded Bee is one of those natives bees. It is known for being a buzz pollinator. It bangs its head against the flower’s anthers 350 times a second. That is seriously fast and does a great job pollinating our tomatoes. Erica Siegel’s beautiful photo shows it piercing the Correa flower to source its nectar. Plant a range of native flowers including Correa, Hibbertia, Spider flower grevillea, Myrtle, Flax lily, a good range of Salvias (particularly blue) and Sage, Rosemary, Lemon balm, Lavender, Basil plants particularly Perennial basil and of course tomatoes. Let the herbs go to flower!!! Our Gardening for Bees page has a good list of plants for pollinators. The phrase ‘busy as a bee’ takes on more meaning as a recent survey has concluded that the Queen Bee possibly mates up with around 50males. It was once thought that she only mated once. Apparently, the young Queen visits several “drone congregation areas”, has a quick whip around the males and then heads back home. Sadly the males die after mating but that have contributed to the genetic diversity of the hive which is very important. Watch out for our next blog which will focus on the importance of wild hives for the health of bee populations according to Professor Thomas Seeley and local research from CSIRO.